Pasar Percuma. Image courtesy of Rumah Api. It’s a Friday night, you turn a corner off Jalan Ampang into a small dark alley. Walk up the narrow road surrounded by a chaotic jumble of graffiti; “ANTI PUNKS FU*K OFF”, “NO NAZI ZONE”, “ACAB”, “DESTROY POWER, NOT PEOPLE”. Loud distorted guitars, and the banging of drums echoes down the alley, strangely accompanied by Buddhist chants. It becomes very clear, very quickly that this isn’t a typical Ampang alleyway. On one side of the road, you have Rumah Api, where you’ll be welcomed by angry punks and loud music. Just across the road, people gather at a Buddhist temple for prayers. There seems to be a kind of surreal balance, here. It’s surprisingly harmonious. Both places offer a kind of escape from the daily grind and a chance to reflect. Life in KL is competitive, predatory, fast-paced, repetitive, and for many of us kind of depressing. Malaysia is on the one hand “modern”, with its gentrified neighbourhoods and luxury developments. Yet right-wing religious conservatism is also on the rise, with the recent red shirt rally highlighting racial tensions. Meanwhile, the government has strengthened its powers, with the amendments to the Sedition Act being one example; the dirtying of the words “human rights” and “liberalism” another. 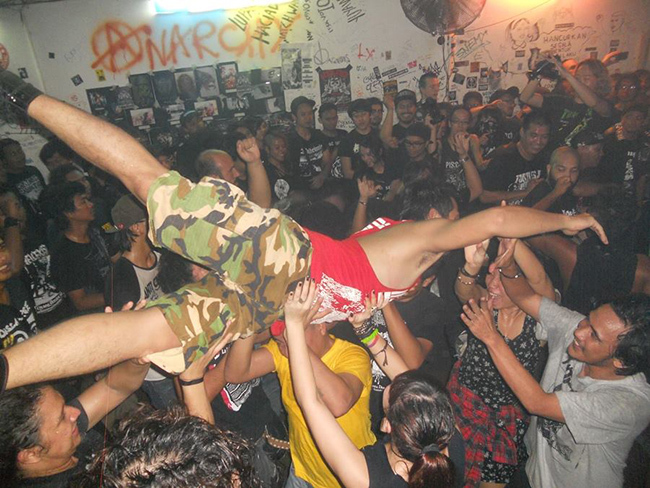 This social climate eventually shaped my path towards punk rock, and that dark Ampang alleyway leading to Rumah Api; a collective space run by a group of punks hidden away among hundred year old buildings in Pekan Ampang. A shoplot in an old-school working class town, Rumah Api is an unusual addition to the old world setting and community that surrounds it. Image courtesy of Lyn Ong. Most importantly, it’s an escape from the condemnatory world outside those walls. People are free to express themselves through music, conversations, and through friendships, regardless of background, ethnicity, gender, and sexuality. Where one can explore alternative ideas and initiatives, and just have fun. All without fear of judgement or punishment. The entrance welcomes patrons with a set of rules and/or guidelines stenciled on black brick walls. 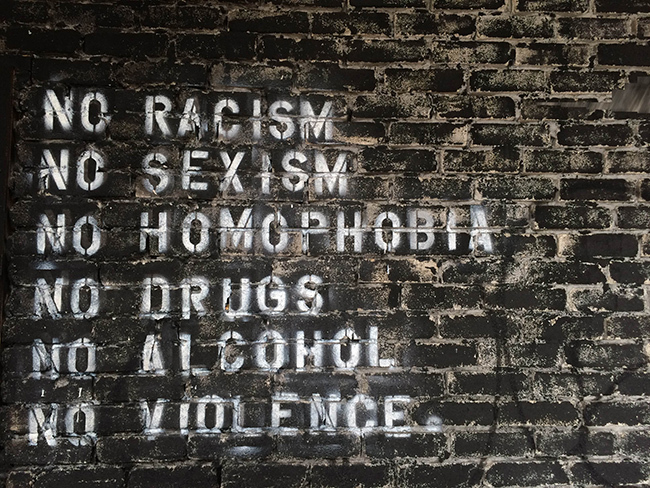 “NO RACISM, NO SEXISM, NO HOMOPHOBIA, NO DRUGS, NO ALCOHOL, NO VIOLENCE”. Inside is a warehouse type space with a small stage. This currently lies empty after a recent raid by police during a punk gig on the eve of Bersih 4. Upstairs is a small record store and living space. Image courtesy of Rumah Api. During the Rumah Api raid, police were targeting “anarchists”, who they assumed were going to provoke violence at Bersih the next day. Over 100 people were detained with no evidence and held in lock up for three days, before being freed without charge. The raid showed how the authorities profiled the punk community, in a similar way to how “Black Metal” was once targeted. Now everyone who listens to a particular type of music, or looks a certain way can be branded as an anarchist, much like how they were branded as satan worshippers years ago. 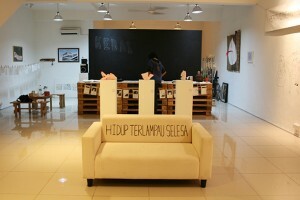 The Rumah Api story began in 2007, when a group of punks decided to find a place for themselves instead of renting random studio spaces for gigs. Gudang Noisey (Noisey Warehouse) was born and remained so until two years later when they couldn’t keep up with the financial and physical responsibilities involved in maintaining the two-storey shoplot. That’s when Man Beranak, a member of local thrash band Sarjan Hassan decided to take on the space. 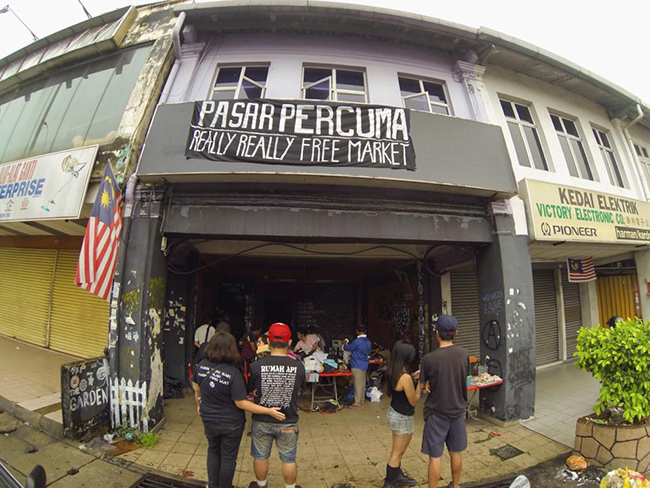 After establishing itself as a collective punk space, the place was attacked by Malay power skinheads (far right nationalists) in 2010 when they set the entrance on fire. Gudang Noisey was then renamed Rumah Api which translates to Fire or Light House, and has since been an active part of the local community, and the global punk community. 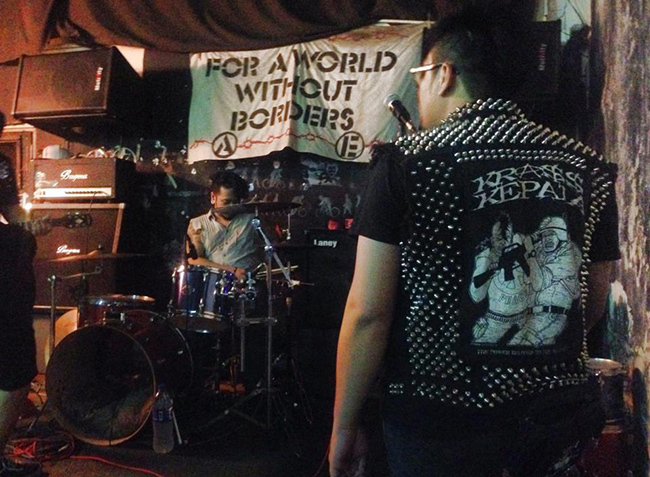 Wan Hazril has been part and parcel of the local punk scene for years. He (among a small group of others) run Tandang Records, the record store in Rumah Api. He has also played for various bands in the local scene which has contributed to the development of Rumah Api into what it is today. 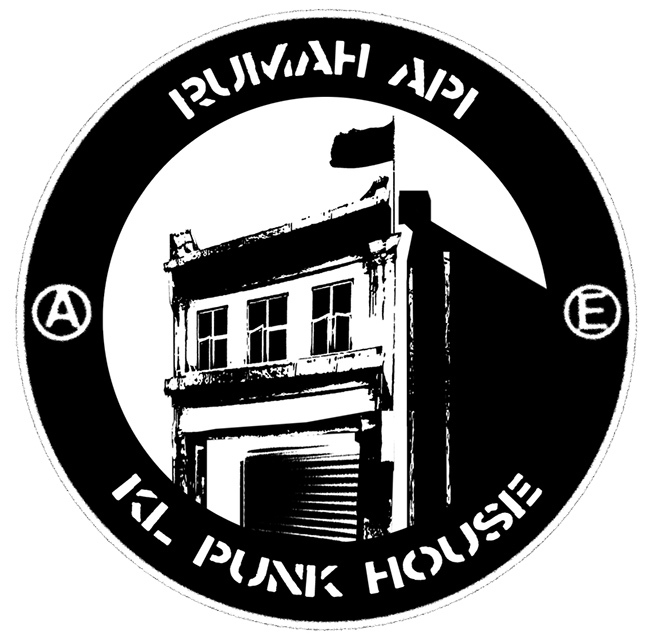 On top of being a safe space for punks and other like-minded people, Rumah Api has managed to establish a friendly relationship with the locals over the years. Through initiatives such as the Really Really Free Market and Food Not Bombs (FNB), they get to directly interact with the locals as a community. The Really Really Free Market allows for anyone to give away what they don’t need, and take what they do. 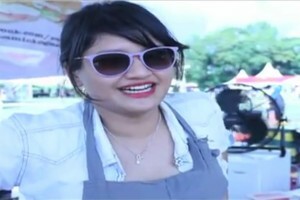 According to Man, “It’s an effort to reduce unnecessary consumerism, and to support and strengthen the local community”. Rumah Api organises one outside their front door periodically, depending on the amount of goods and services collected. Every Sunday, vendors at the local market around the corner, which has been operating every morning for at least sixty years, offers their surplus vegetables and produce for Rumah Api and Food Not Bombs KL to prepare and serve to anyone who needs it. 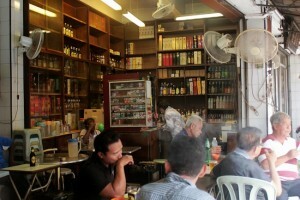 The cooking is no longer done in Rumah Api but instead in an alleyway in Masjid Jamek. Pekan Ampang has its own unique history and charm which is now under threat due to a controversial highway project. 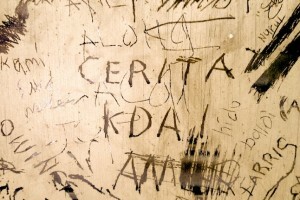 This will force Rumah Api, along with dozens of other businesses and homeowners to find new beginnings elsewhere, which is a huge challenge in itself, especially for the punks. With this development, as well as having to deal with the police and legal issues after the raid, Rumah Api faces some big hurdles. “It’s not easy for us to find a new home. People aren’t always accepting of our lifestyle and music, not to mention the financial problems that come with moving,” says Man. “Thankfully we have strong support from friends all over the world, so hopefully it all works out and Rumah Api can live on in a new space, or maybe we won’t have to move at all. We’re not going to give up our home that easily”, he adds, with a cheeky smile. Navshed Navin is a member of the Rumah Api community.